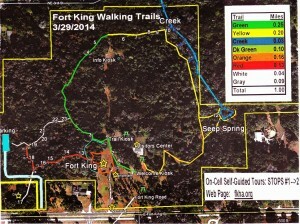 A couple months ago was the opening of the new Fort King Park in Ocala. I could not make the opening, but was able to visit a few week later. Below, this is one side of the park brochure. Visit the park to see the rest. The Fort King site has been the most important Seminole War site that we have been able to preserve and open to the public. Fort Brooke was turned into a parking garage. Part of the site for the Battle of Okeechobee was obtained by the state to develop into a park, but it is only open once a year for the annual reenactment, and not much progress of it being developed into a park that is open year-round. The prospect of saving any more Seminole War sites is not going to happen very often. So it is very refreshing that we suddenly have a new Seminole War park to visit. For Seminole War forts, you can visit Fort Foster or Fort Christmas, and that is it. 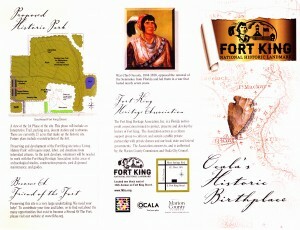 But Fort King was one of the most important forts in Florida during the 2nd Seminole War. It was the fort with the main Indian Agency in Florida, and removal talks were held here in 1834 to 1835, which did not help make any peace but fanned the flames of warfare that soon came. Once the war had started, the fort was the main military post for forays into the interior of the peninsula in north central Florida. 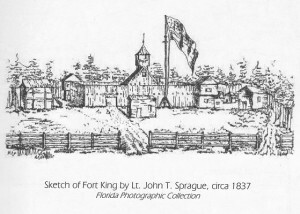 Below, Fort King as seen in 1839 by Capt. John T. Sprague, who was there with General Alexander Macomb. Back around 1999, I was driving by the property and there was a large “for sale” sign on the property. We knew it was the fort property, and that Mrs. McCall has lived there for years. Hoping that it could be preserved and not lost, I immediately emailed Dr. John Mahon, Frank Laumer, Brent Weisman, and anyone I could to try and preserve the site. Long story short, not only was the property saved and now maintained as a park by the city of Ocala, but it also has National Historic Landmark status. The next step has been to make this park open to the public. So now a trail system has been created with information kiosks, and the old McCall house has been turned into a visitor center. It is a very good start, but it has much further to go. The interpretive signs on the trail are very good. Some of the text is good, but others have some glaring errors. And there is no mention of the fort being abandoned for three years from 1829-1832. Unfortunately the property is covered by exotic plants that will take years to remove. I feel that this would be very important to do, to restore the natural communities. When the fort was active, all the vegetation would have been removed, and I don’t want to see that, but natural native plant communities would be nice. The museum is just beginning. The exhibits are a few posters and some artifacts. A big screen TV shows the hilariously inaccurate “Seminole” western movie made in the 1950s, starring Anthony Quinn as Osceola. A more appropriate film would be better. Hopefully the park will keep its mission and purpose in focus, and not try to be a park to cater to every type of recreational activity. It needs to stay as a historic park, and doesn’t need basketball courts or fitness trails. These are things available at nearby parks, and clutter up the park with unnecessary activities and maintenance. Currently the friends group or park support group is strictly local. This is a site that is important for all of Florida history, so the group needs to be expanded beyond just local people in Ocala and Marion County. But the good news is that the site has been saved and preserved as a park that is open every weekend, so this is just a start. 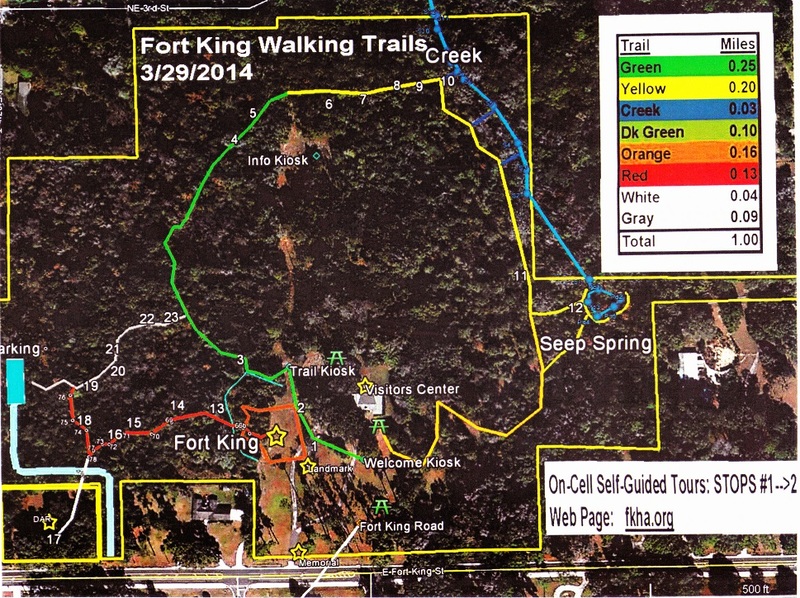 Fort King has the potential to become a major park.